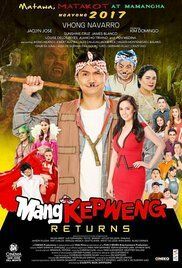 The story revolves around Kiefer (Vhong Navarro), a normal guy who lives a quiet life until he goes through bizarre experiences, seeing ghosts and evil spirits. With these, his mother (Jacklyn Jose) is forced to tell him the truth that he is Mang Kepweng's son. With Kiefer's determination to know more about his roots and how he is connected to the paranormal occurrences he is experiencing, he travels to the provinces meeting his half-brother Zach (James Blanco), a successful doctor who cannot cure his wife's (Sunshine Cruz) mysterious illness. Read more on Wikipedia.